Approaching the end of the series, 2018 Rittenhouse Game of Thrones Season 7 remembers the first part of the final GoT season. Every box contains a pair of signatures from the Game of Thrones cast, including more than 20 first-time signers across all seven seasons of the show. 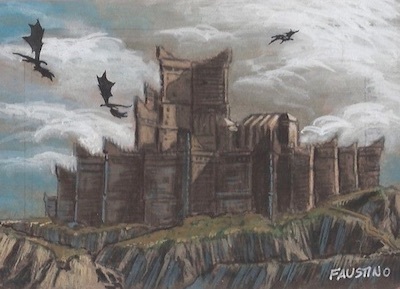 Like the many other Game of Thrones trading card sets, a custom album gives collectors a place to store their cards. The listed SRP for the album, which includes an exclusive promo card, is $24.99, while sealed boxes check in at $99.99. 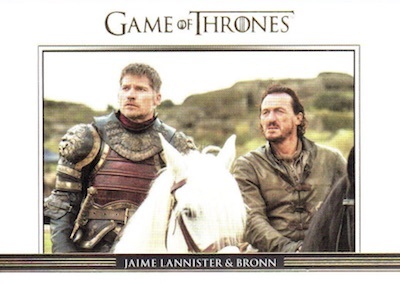 Covering the smallest group of episodes thus far, the 2018 Rittenhouse Game of Thrones Season 7 checklist includes 81 base cards. There are a total of three cards for each of the seven episodes, plus a large number of character cards to fill out the ranks. The full base set is expected in each box. There are also Foil base parallels at 1:3 packs and Gold base parallels at one per box (or 1:24 packs). 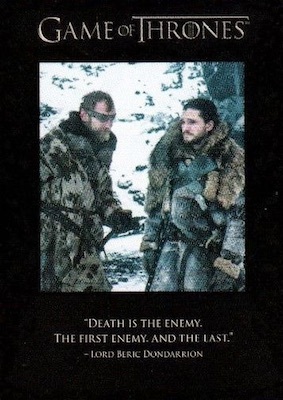 The 2018 Rittenhouse Game of Thrones Season 7 inserts offer a familiar Game of Thrones selection. This includes Beautiful Death (7 cards; 1:42), Quotable (9 cards; 1:12 packs) and Relationships (10 cards; 1:24 packs). In addition, Gold insert parallels are extended to Beautiful Death (1:288 packs) and Relationships (1:144 packs). 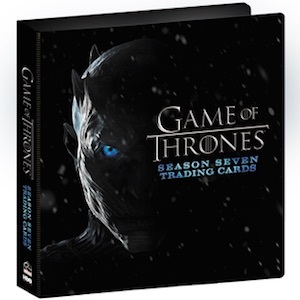 Tougher insert sets consist of Valyrian Steel Expansion base metal (9 cards; 1:96 packs) or Gold versions (1:288 packs), and the Winter is Here poster line (12 cards; 1:144 packs). 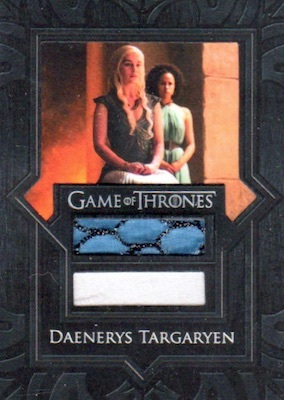 Rare Sketch cards and Relic cards are also randomly found, including the very first Daenerys Targaryen dual relic. 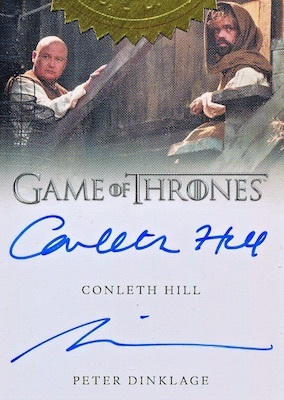 Dropping two per box are the many cast Autographs in 2018 Rittenhouse Game of Thrones Season 7. 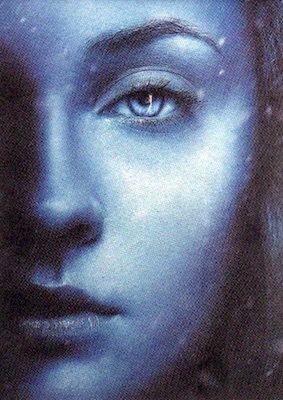 Not limited to only season seven, the lineup looks back at prior years, as well, adding many debut signers to go with show stars like Maisie Williams (Arya Stark), Nikolaj Coster-Waldau (Jaime Lannister), and Sophie Turner (Sansa Stark). Finally, we get to the bonus cards earned by making multi-case purchases. A snapshot of each tier for the Rittenhouse Game of Thrones Season 7 incentives is shown below. PARALLEL CARDS: Foil (1:3), Gold (1:24), Printing Plates 1/1 (Archive Box). 43 Sandor Clegane "The Hound"
63 cards. 1:12 packs. Shop autographs on eBay. Short Print Key: Limited (L) = 300-500; Very Limited (VL) = 200-300; Extremely Limited (EL) = 100-200. 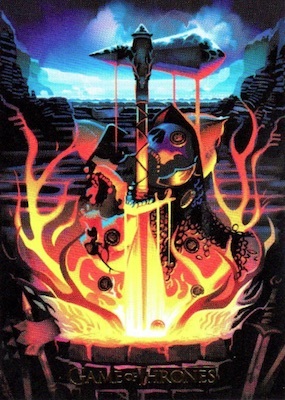 PARALLEL CARDS: Foil #/150 (1:288). PARALLEL CARDS: Gold #/225 (1:144). Builds on Valyrian Steel checklist numbering. 3 cards. 1 per case. PARALLEL CARDS: Gold (Archive Box). FYI: There’s a full, printable checklist available at the scifi hobby website (Rittenhouse) now. The autograph list looks amazing! 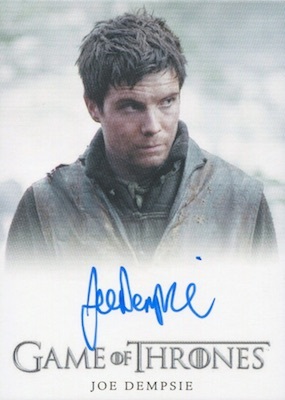 There’s a few of the usual stars (Maisie, Nikolaj, Sophie) but I’m guessing that the extremely limited Jim Broadbent and Joe Dempsie (Gendry) will be in demand. There’s a ton of new signers as well as old signers but now on full-bleed cards which are the ones I prefer. So, now I’ll be replacing those bordered cards with the full-bleed ones. My wallet will be on fire. Yup, added it about 30 minutes ago. You should be able to see it using the checklist tab above.